On the left, replica of the "March of Silence" organised by students in Mexico City in 2018. 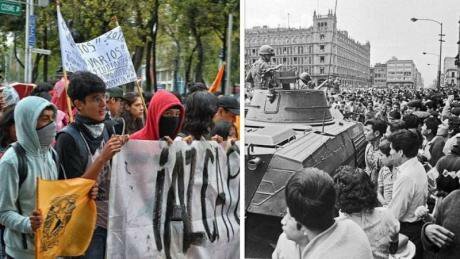 On the right, march on the Zócalo, also in Mexico City, but during the movements of 1968. Photographs: Global Voices. All Rights Reserved. Today, the struggle to stop violence in Mexico continues. On September 6, 30.000 university students, including those from the National Autonomous University of Mexico (UNAM), Mexico's largest public university, gathered for a massive student demonstration. This protest was organized in response to events, three days before, in which shock groups, known as porros, allegedly attacked students within the College of Sciences and Humanities. The students there were peacefully calling for an increase in human resources for the faculty and calling for justice for fellow student Miranda Mendoza, who was killed in August. The protesters’ general demands include increased security within the dozens of UNAM's faculties, schools, centers, and research institutions. They also demand the expulsion from university premises of the porro groups, who allegedly receive political and economic bonuses in exchange for violently attacking student demonstrations and destabilizing university life. Today's demonstrations symbolically mark the 50th anniversary of the Mexican Student Movement of 1968 which demanded the release of political prisoners, the resignation of the ruling party, and expansion of political liberties as well as democratic changes to eradicate authoritarianism. The government viewed these protests as an attempted coup d'état by Communist groups and a threat to national security, and responded aggressively with heavy-handed use of force. At the time, the government viewed these protests as an attempted coup d'état by Communist groups and a threat to national security, and responded aggressively with heavy-handed use of force. Several marches, sit-ins, demonstrations, and protests ensued, including the March of Silence on September 13, 1968, during which demonstrators covered their mouths with white bandannas to protest the government's silence about the Movement and its use of brutal force against students. On October 2, 1968, over 10.000 students organized a peaceful march in the Tlatelolco area of Mexico City, and their gathering was repressed with extreme violence by the Mexican government. Over 300 people were killed and the tragedy is remembered today as the Massacre of Tlatelolco. As the anniversary of these historical events approached, the feeling among students was one of strong solidarity with their predecessors: they decided to replicate the March of Silence on its anniversary date, September 13, to honor the people who marched on these same streets for similar causes than the ones which motivate today’s marches. Fifty years later, marches, memorials, and photographs contrasting protests both past and present have been shared through social media with hashtags such as #MarchaDelSilencio and #A50Del68. Animal Político has published a series of chronicles from 1968 on the same dates as the historical marches. Other journalists, like Leopoldo Gómez, have taken a closer look at the student movement of yesterday and today: “The protest is no longer about repression, but governmental incompetence. In 1968, protesters fought against government excesses; now they demand more: they want good governance. Endemic violence in Mexico, where more than 70 people are murdered daily, is only one partial cause for the protests. Endemic violence in Mexico, where more than 70 people are murdered daily, is only one partial cause for the protests. This year also marks the fourth anniversary of the 43 missing students of Ayotzinapa, each of whom the students remembered. Historian Octavio Solís notes the symbolic force of the 1968 protests in which “imagination defeated power”: “The student movement of 1968 gathered the demands of several social spheres that had been unable to find a way to speak out. This article was previously published by Global Voices and can be read here.